Amazon S3 public and private buckets can be used as origins with Fastly. To make your S3 data buckets available through Fastly, follow the steps below. In the Address field, type the appropriate address for your region. For the standard S3 region (us-east), type s3.amazonaws.com. For all other regions, type s3.<REGION>.amazonaws.com, replacing <REGION> as appropriate for the non-standard region you're using. TIP: If you're using S3 to host a static website, set Enable TLS? to No. Amazon doesn't support TLS connections to S3 buckets with the static website hosting feature enabled. You can still use one of Fastly's TLS service options to secure connections between Fastly and clients. In the Transport Layer Security (TLS) area, type s3.amazonaws.com in the Certificate hostname field. In the Override host header field, type the hostname of your S3 bucket. For example, <yourbucket>.s3.amazonaws.com. TIP: If you're using S3 to host a static website, the hostname is <bucket_name>.s3-website-<aws_region>.amazonaws.com, where <bucket_name> is the name of your S3 bucket, and <aws_region> is the name of the AWS region (e.g., mygreatbucket.s3-website-us-east-1.amazonaws.com). We recommend enabling CORS (Cross-Origin Resource Sharing) when using Amazon S3 as your origin. To enable this, follow the instructions in our guide on enabling cross-origin resource sharing (CORS). Bucket name The name of your AWS S3 bucket. When you download items from your bucket, this is the string listed in the URL path or hostname of each object. Region The AWS region code of the location where your bucket resides (e.g., us-east-1). Access key The AWS access key string for an IAM account that has at least read permission on the bucket. Secret key The AWS secret access key paired with the access key above. Once you have this information, you can configure your Fastly service to authenticate against your S3 bucket using header authentication by calculating the appropriate header value in VCL. set bereq.http.Authorization = "AWS4-HMAC-SHA256 "
"Credential=" var.awsAccessKey "/" var.scope ", "
Using VCL Snippets, Fastly can follow redirects to S3 objects and cache the response. Click the Create snippet button. 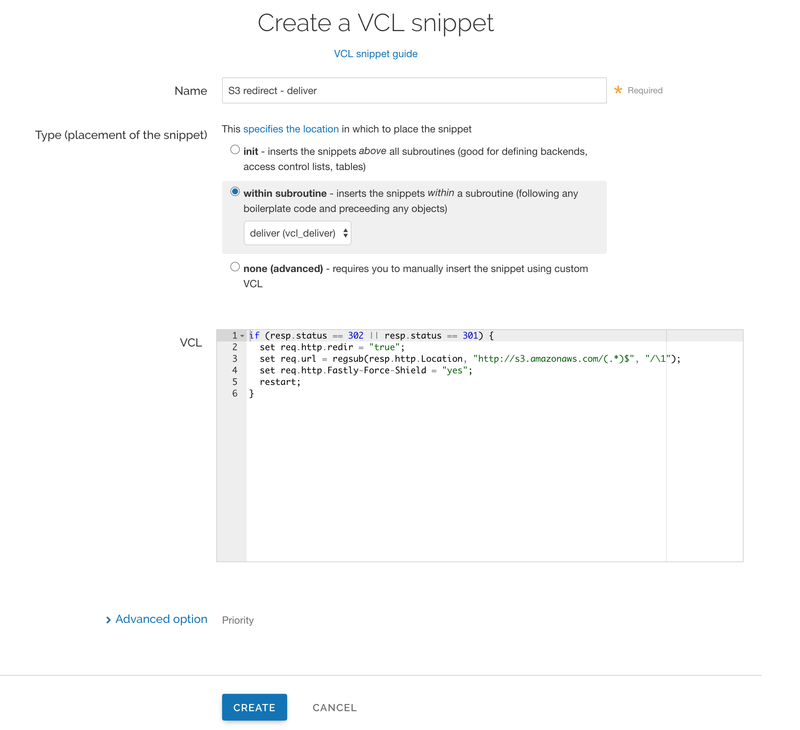 The Create a VCL snippet page appears. In the Name field, type an appropriate name (e.g., S3 redirect - recv). Click the Create snippet button again. 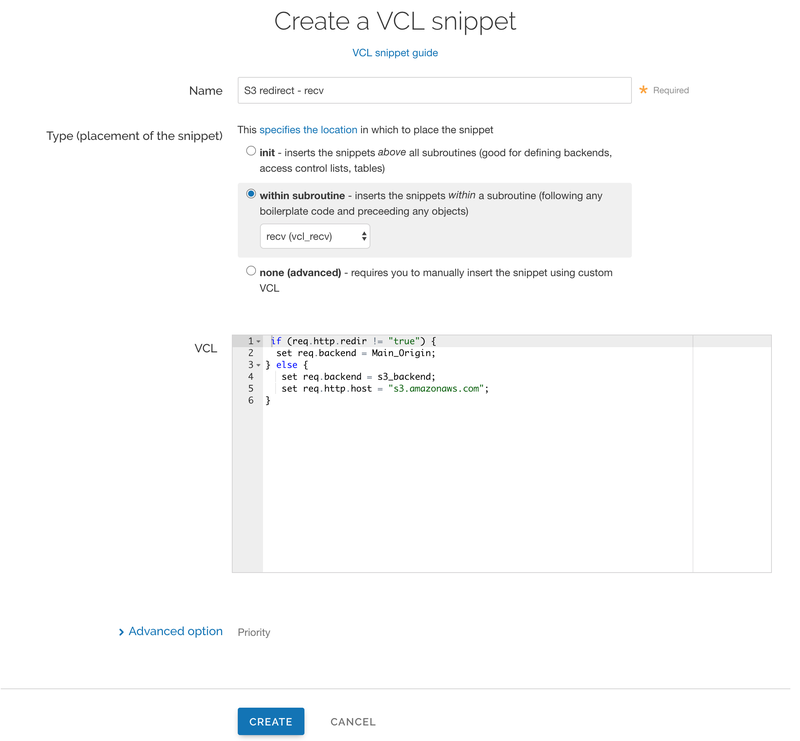 The Create a VCL snippet page appears. In the Name field, type an appropriate name (e.g., S3 redirect - deliver). Be sure to set the Main_Origin and s3_backend to the actual name of your backends in the service to which you're applying these redirects. Find the exact names by clicking the VCL button at the top of the page while viewing the service and reviewing your VCL.